Beach Dance is an extraordinary dance experience where music, movement, mother nature and you merge. It was created by Lila Danielle out of love for the ocean, ecstatic dance and community. It began in June 2008 on a cool and cloudy day along the north Oregon coast with fifteen dancers. During the past ten years, over two thousand people have participated in Beach Dance events. For the first four years, weekend events were held during the summer months in Cannon Beach, Oregon. 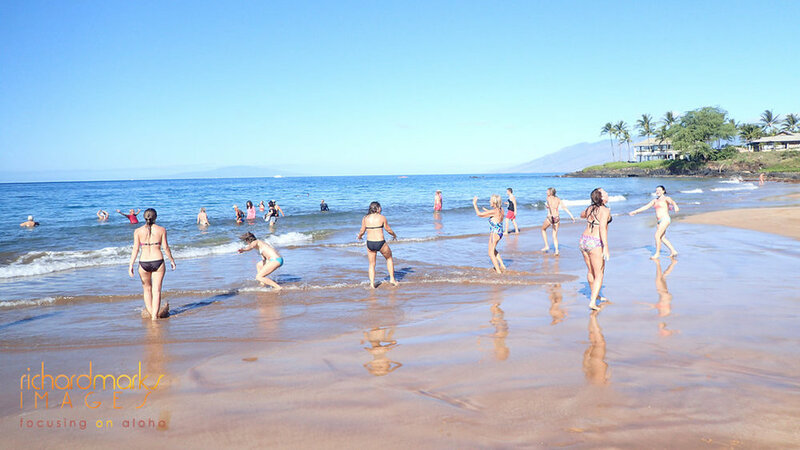 In January 2012, Beach Dance began in Maui, Hawaii and events are held year-round. Website photography by Richard Marks unless otherwise noted. During events, each person is equipped with a waterproof iPod and headphones that have been synched with an identical playlist of songs. After turning on the devices simultaneously, participants dance to an hour of music that’s been especially created to include different rhythms, beats and genres of music. No previous dance experience is necessary. The only steps you need to follow are your own. Before every dance, a comfortable and welcoming space is created for all participants through brief introductions and a bit of inspiration. While safety considerations and technological tips are provided before the event begins, minimal instruction is given. You move your body the way it wants to move. You create your own dance. At the conclusion of the event, iPods and headphones are returned and a brief closing circle takes place in which participants are welcomed to share their thoughts about the experience if they'd like to. Altogether, the event is approximately 90 minutes in length. Beach Dance events are kept at a maximum of fifty people and iPods are given out on a first-come, first-serve basis. Due to the unique listening experience, participants are encouraged to arrive 15-30 minutes prior to our start time of 9:00 a.m. to insure receipt of an iPod. After 9:00 a.m., late-comers are welcome to join us in the dance, however iPods will not be distributed after this time. You are welcome to bring your own device and dance to your own music. Events are open to men and women of all ages and children over the age of twelve are welcome with parents’ permission. The dance is free of charge and donations are happily accepted. come and join us for a Beach Dance soon! your body knows how to move. moving your body is a dance. dance is art in motion. What Happens at Beach Dance? 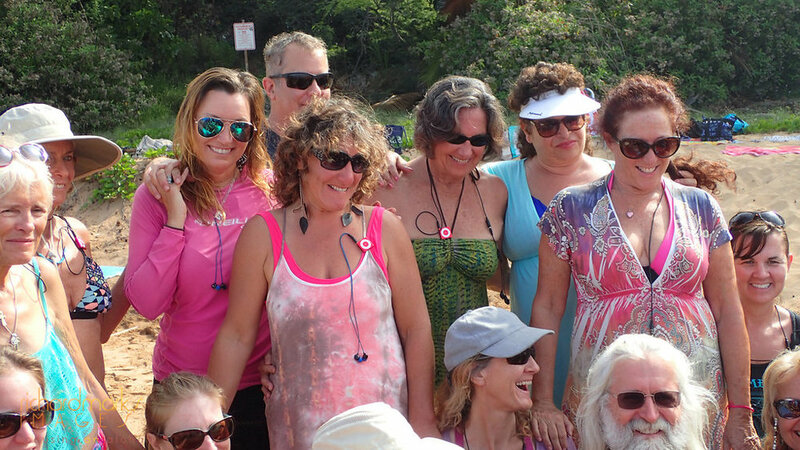 While each person has their own unique experience of Beach Dance, every event is created with the intention for participants to thoroughly enjoy themselves and experience a wide range of emotions and other human encounters of the mind, body and spirit. What follows are some of the "most-likely-to-occur-happenings" in attending a Beach Dance. Having fun and playing with your own innate creativity and imagination. Listening to a variety of music designed to move your body and your being. Enjoying the beauty of being in nature. A great physical workout from dancing on the sand and in the water. A sense of belonging to the group and being a part of a compassionate and caring community. A feeling of utter joy and delight. A sudden urge to laugh out loud or burst into tears. A feeling of freedom, oneness and love. A deep connection to something greater than yourself. Really seen and heard by others. You have a profound emotional or spiritual experience during the dance. You think Beach Dance is one of the best things you've experienced while visiting Maui. You spend a morning dancing with strangers who become amazing new friends. You come back to Beach Dance every week (if you live on Maui) or as often as you can (every time you visit). We are the ecstatic movers and not-so-silent shakers of the world. We are the ones who meet you with our hands held up and our hearts wide open. We welcome in our fierce and fragile natures, honoring the human and holy beings that we are. We listen and speak with our whole bodies and hold presence for each other. We cherish the space of creative expression and belonging we create together. Being the expression of who you really are. Isn't dancing on the beach just simply dance? Well...yes, and no. We can move our bodies and dance our physical selves silly and absolutely have a great time doing just that. This is what most people might consider 'dancing' and that, in part, would be true. And the truth is...dancing in this way is what the majority of us are completely content with doing and that's grand. Beach Dance is a fun, music-loving, body-shaking time and...it offers more. There is also another part to dancing that goes beyond just moving our physical selves into a state of pleasurable bliss. People who make dance a daily or weekly habit, a steady practice or a life-long exploration know there's a lot more to dance than just moving our bodies and feeling good. As multi-layered human beings, there is a vast amount of territory we can delve into and dance with. We bring not only our bodies to the beach, but everything that is held within our bodies; our stories and histories, our previous experiences and future dreams, our personal and collective beliefs, our broken hearts and mended bones. We bring all of this and more not only to our dance, but to our daily lives. With all of this "stuff" to dance/live into, dance/live with and dance/live through, there is much we can learn about who we really are from how we move in the world. Are the ways in which you move your body, an expression of what you stand for, why you're here and who you really are? How might the world move differently if you did? What if every time we danced, we discovered and remembered that beyond all that "stuff" we carry within our bodies, we really are joy, freedom, compassion, presence, light and love? Perhaps your dance might change. Perhaps your life might change. Perhaps even the world might change. And so we dance. 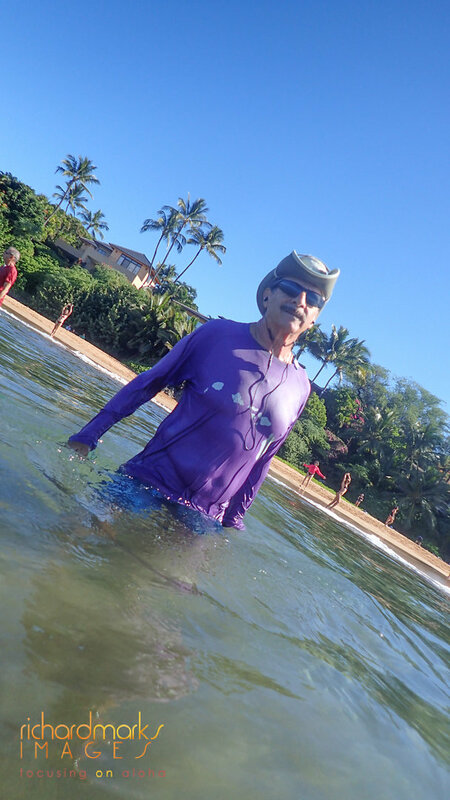 At Beach Dance, the expression of who you really are is welcomed, encouraged and celebrated.